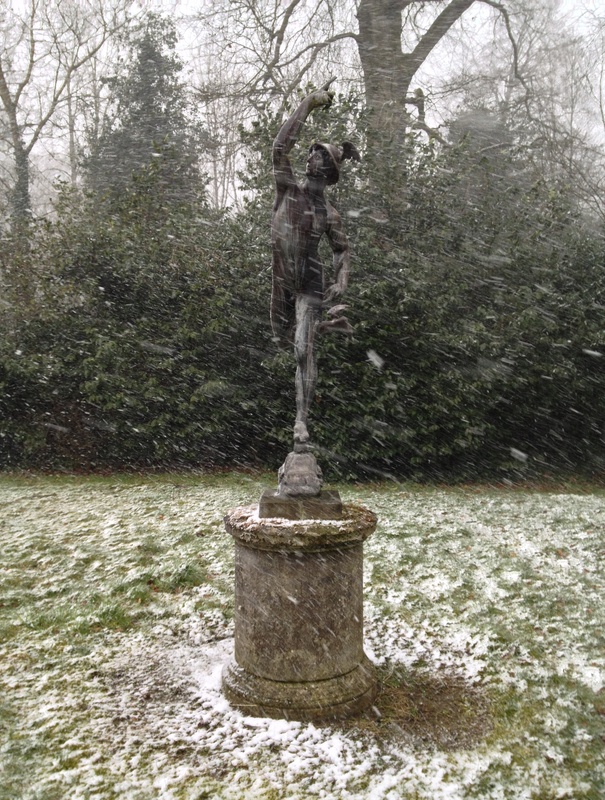 The onset of snow yesterday morning in the grounds of Ardbraccan, County Meath. The deity points heavenward and enquires with good reason: whither the weather? In 1760 James Caulfeild, Viscount Charlemont (he would be created first Earl of Charlemont three years later) wrote in his memoirs, ‘I quickly perceived and being thoroughly sensible it was my indispensable duty to live in Ireland, determined by some means or other to attach myself to my native country: and principally with this view I began those improvements at Marino which have proved so expensive to me.’ Wonderfully situated on rising ground looking south across Dublin Bay and towards the Wicklow Mountains, Marino was Lord Charlemont’s pocket estate just a couple of miles east of Ireland’s capital. At its heart were some 50 acres acquired by his stepfather Thomas Adderley on which the latter built a residence originally called Donnycarney House. This he presented in 1755 to Charlemont on the young man’s return from a Grand Tour lasting no less than nine years during which period, together with time spent in the customary European destinations, he had taken an extended voyage to Greece, Turkey and Egypt. 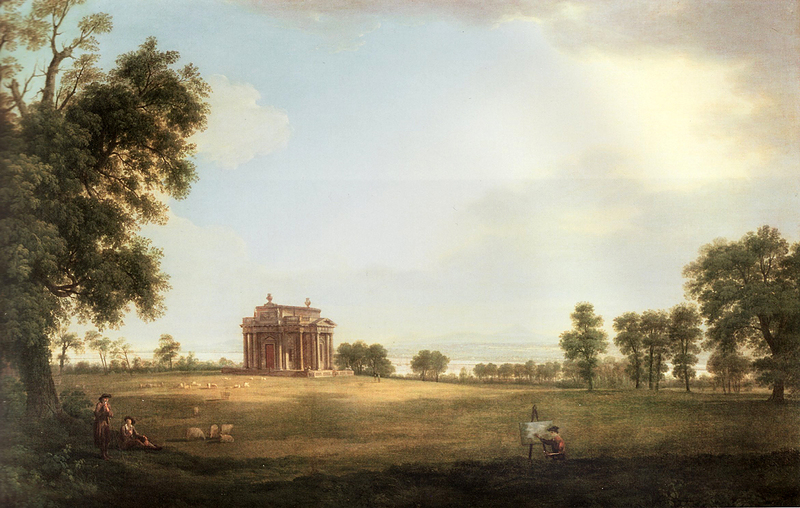 However, unquestionably the most important country visited by Charlemont was Italy and the painting above, painted in 1773 by Thomas Roberts, Ireland’s finest landscape artist of the 18th century, portrays the kind of arcadian Italianate view first proposed over 100 years before by Claude Lorrain and Poussin, complete with shepherd and flock of sheep. 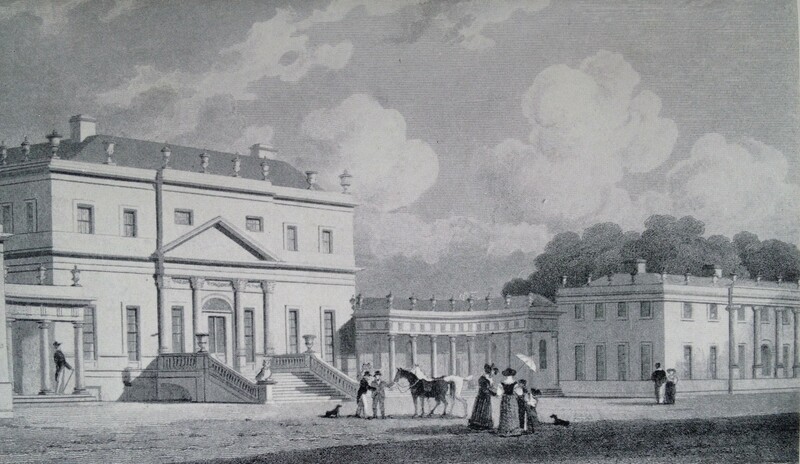 The picture furthermore gives expression to Charlemont’s ambition to improve not only the Marino estate but also the country of which it was part. 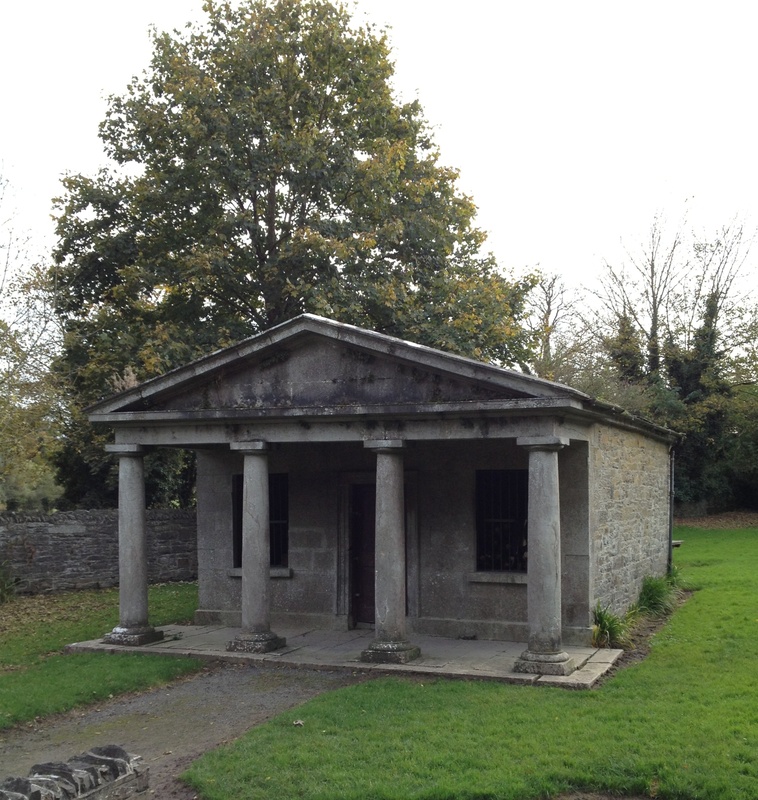 This is embodied by the building at the heart, if not the actual centre, of the painting: a small temple or casino. While in Rome during the course of his Grand Tour, Lord Charlemont came to know a number of artists such as Pompeo Batoni, whose wonderful portrait of him can now be found in the Yale Center for British Art. He also associated with Giovanni Piransi, the first four-volume edition of whose Antichitá Romane (1756) was dedicated to his Irish friend, ‘Regni Hiberniae Patricio’ although the two men subsequently quarrelled. But the link to Piranesi demonstrates Charlemont’s interest in architecture from an early age, also evidenced by his commissioning a design for a garden temple from Luigi Vanvitelli, today best-known for the enormous Bourbon palace of Caserta. 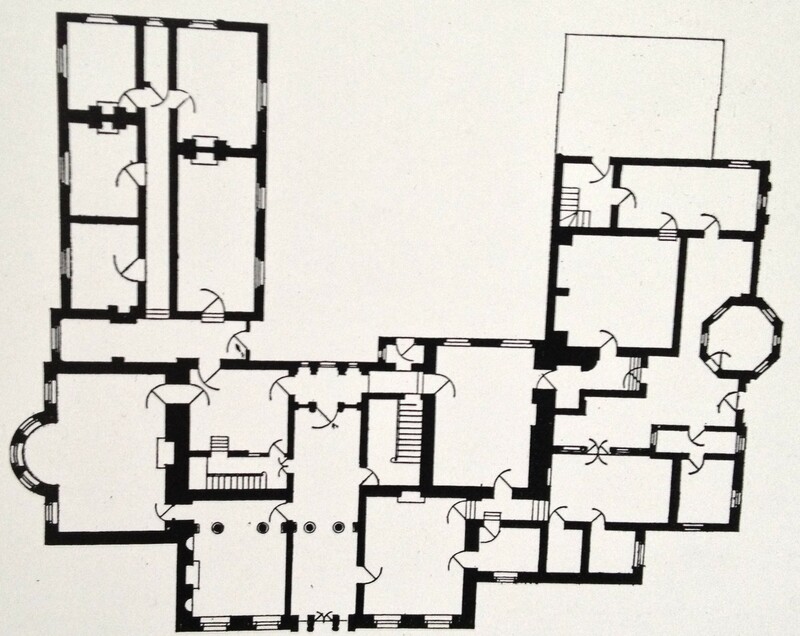 Vanvitelli’s proposal for an Irish building was rejected on the grounds of expense, but another architect with whom Charlemont first became acquainted while in Rome produced a more satisfactory, if ultimately no less costly, scheme. 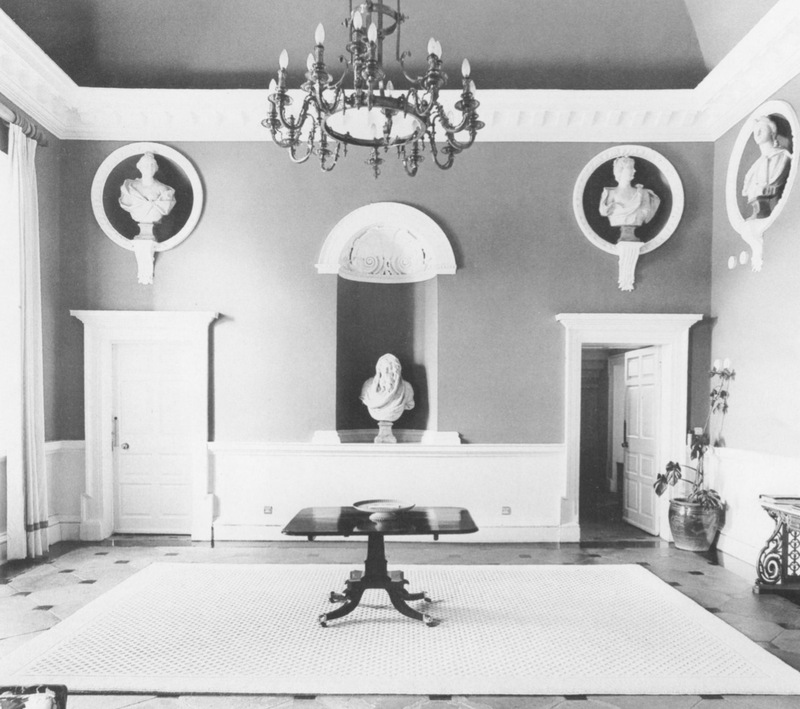 This was Sir William Chambers, responsible not just for the casino in the grounds of Marino but also Charlemont’s superb townhouse in central Dublin (today the Hugh Lane Gallery of Modern Art). Despite designing both these buildings and Trinity College’s Chapel and Examination Hall it should be noted that Chambers never came to Ireland. 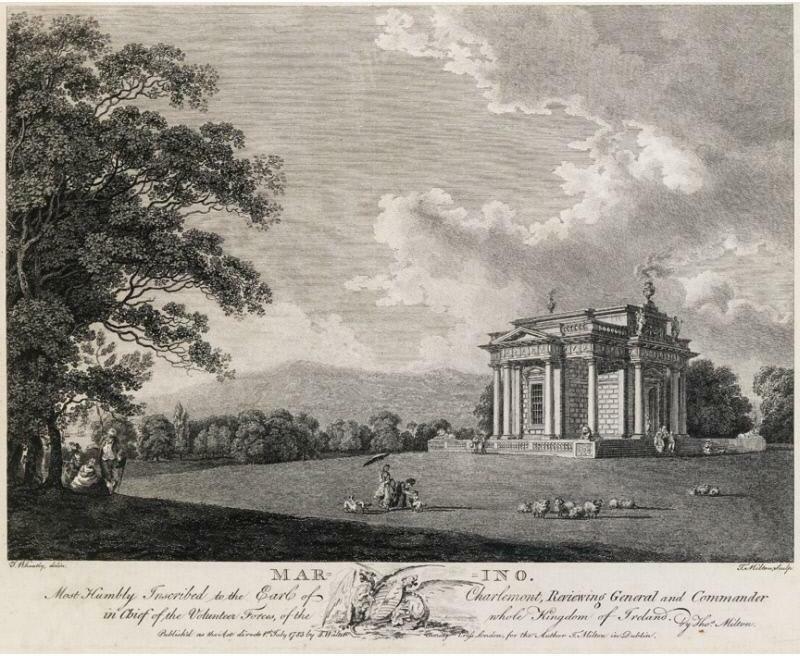 Work on the casino at Marino was not completed until the mid-1770s perhaps in part because its owner placed many other demands on his income and was therefore constantly short of funds. But even before completion the building’s exceptional merits were recognised, as can be testified by the number of artists who produced paintings in which it features. Aside from Thomas Roberts, there was James Malton whose watercolour dated 1795 is shown above, together with an engraving by Thomas Milton after Francis Wheatley which was produced twelve years before. 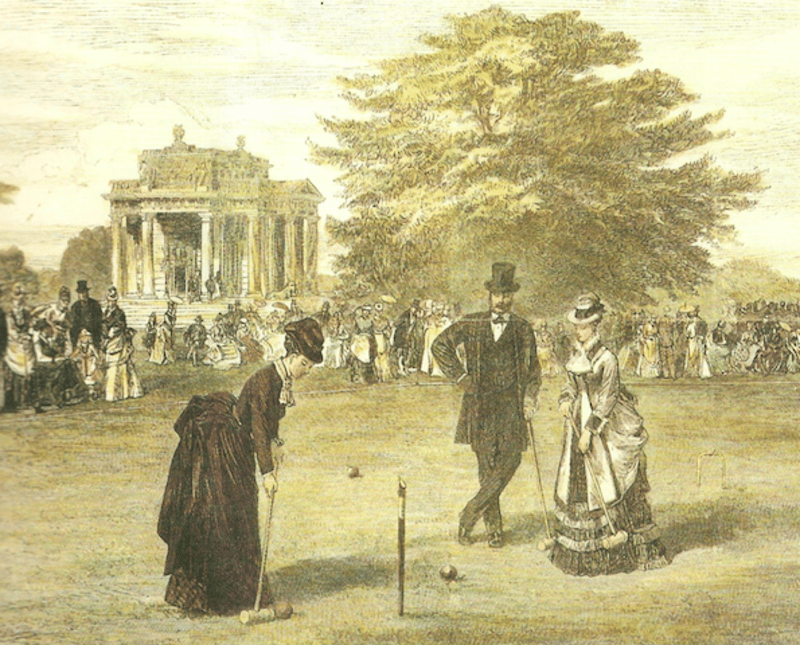 Jonathan Fisher, James Coy and George Mullins were among those who also exhibited work depicting the casino during the same period. It is difficult to think of any other building, certainly one of the casino’s relatively modest proportions, that attracted as much notice in 18th century Ireland. The sublime perfection of the casino at Marino – contained within a elaborately carved Portland stone exterior the Greek Cross plan measures just 40 by 40 feet yet contains 16 rooms spread over three floors, many of them with splendid plasterwork and inlaid floors – has been often described and analysed, and I do not intend to do either here. 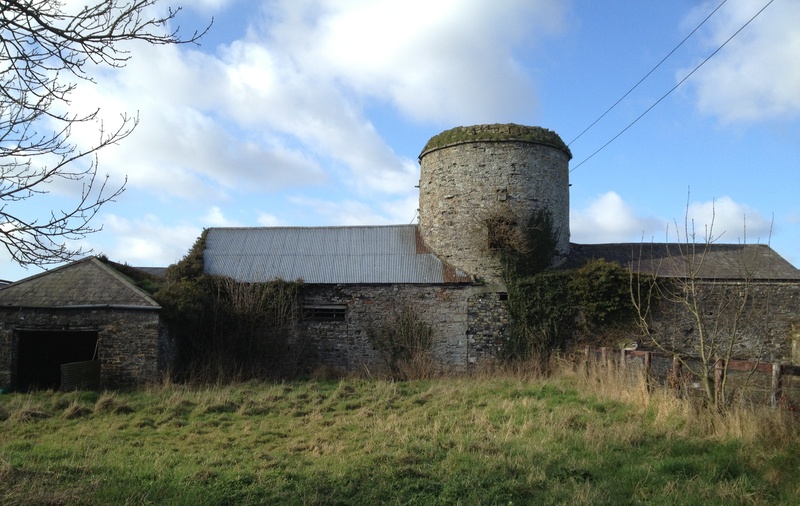 Less appreciated is the fact that this was just one of a number of ornamental buildings once found on Charlemont’s estate which he gradually extended to three times its original acreage. size. 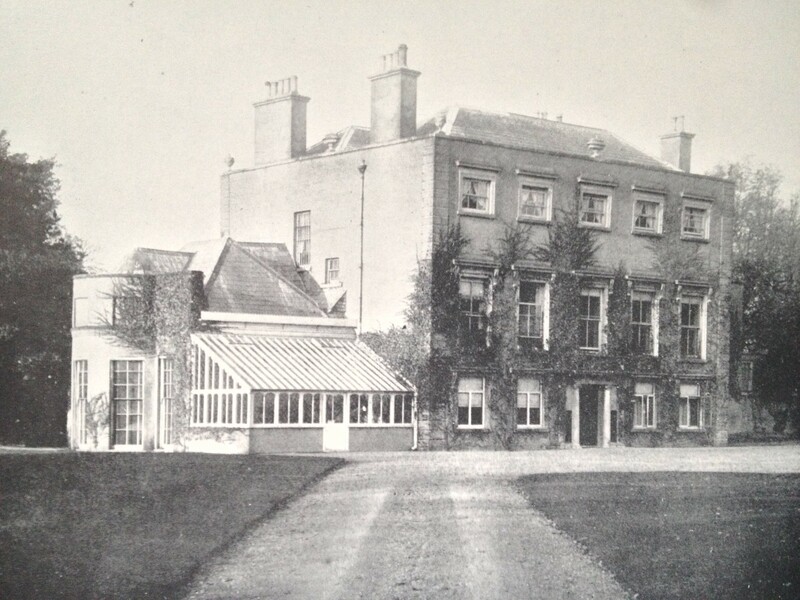 The main residence was Marino House seen above; the early 20th century photograph shows the principal facade behind which were two long wings creating a kind of rear courtyard; the rooms here included an important library and a gallery to accommodate some of the owner’s extensive book, picture and sculpture collection. 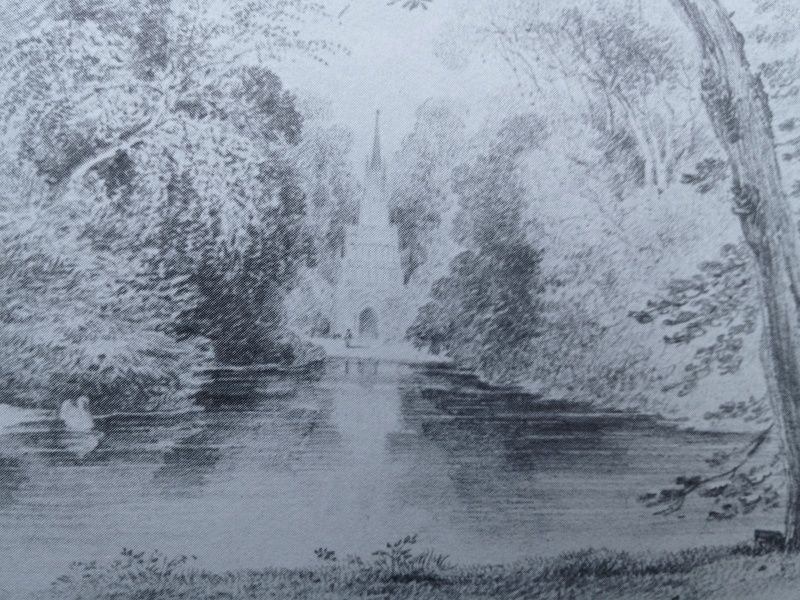 We know that Charlemont employed Matthew Peters to help with the design of the parkland at Marino. Born in Belfast, before settling in Dublin in the early 1740s he had worked as a gardener for his uncle who was employed by Lord Cobham at Stowe, Buckinghamshire. 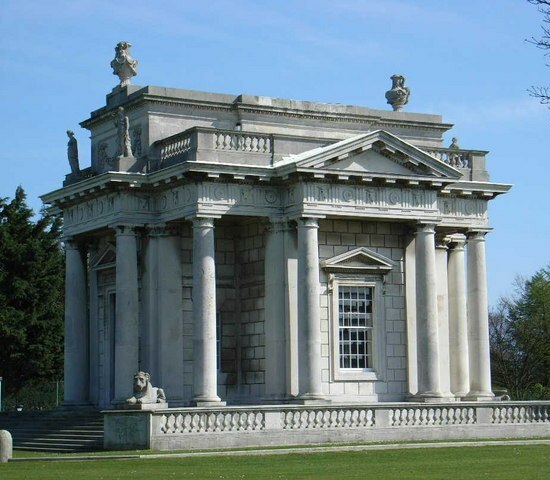 Given the influence exerted by Stowe’s park for many years hence, Peters’ presence there as a young man strikes me as highly important in the layout of Marino. In the evolution of garden design during the 18th century from French-style formality to the supposedly natural but carefully planned ‘English garden’ championed by Capability Brown (who also worked at Stowe), a slightly earlier alternative to the former was proposed. 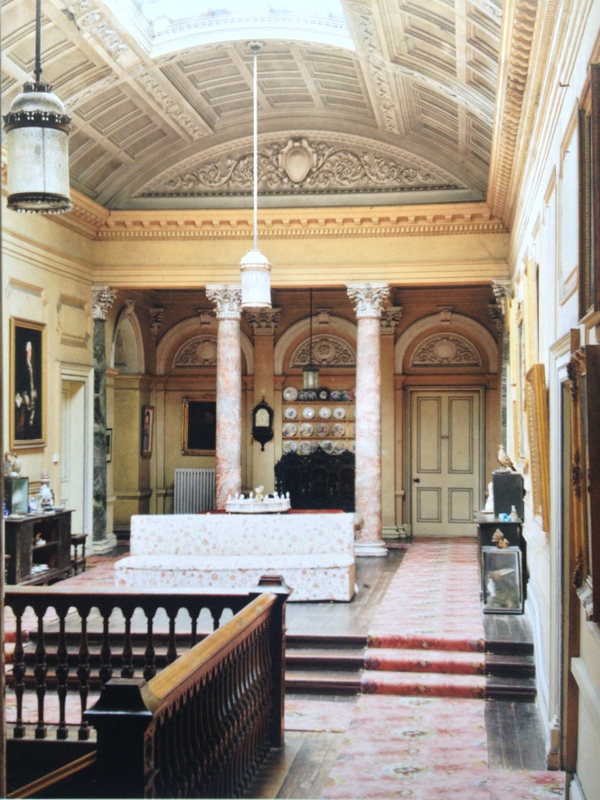 Best described as picturesque it is represented today by the likes of Stourhead in Wiltshire and Painshill, Surrey; can it be mere coincidence that the man responsible for the latter’s creation, the Hon Charles Hamilton, was born in Dublin the son of an Irish peer? 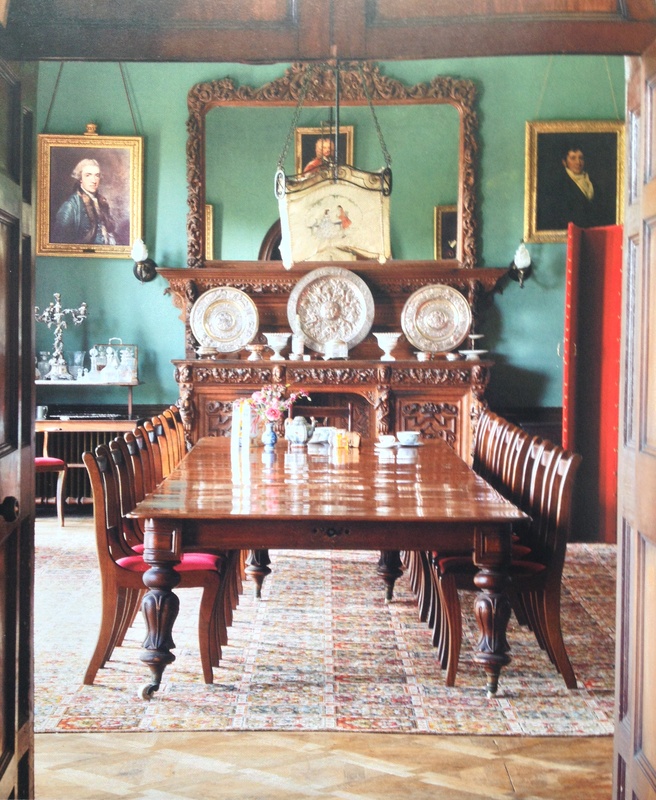 At Stourhead and Painshill – both of which evolved around the same time as Marino – the park is treated as a series of rooms, each with its own character and focal point. Visiting them is like moving around a gallery holding different but complementary paintings and, I would propose, the same was once also true of Marino with the casino as the finest but by no means the only item meriting visitors’ attention. 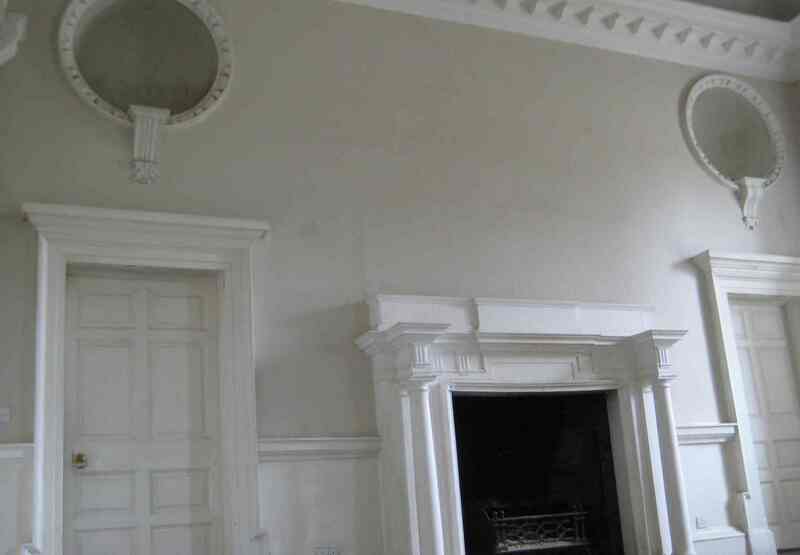 So at Marino, Charlemont’s park once held an extensive series of buildings of widely divergent character. 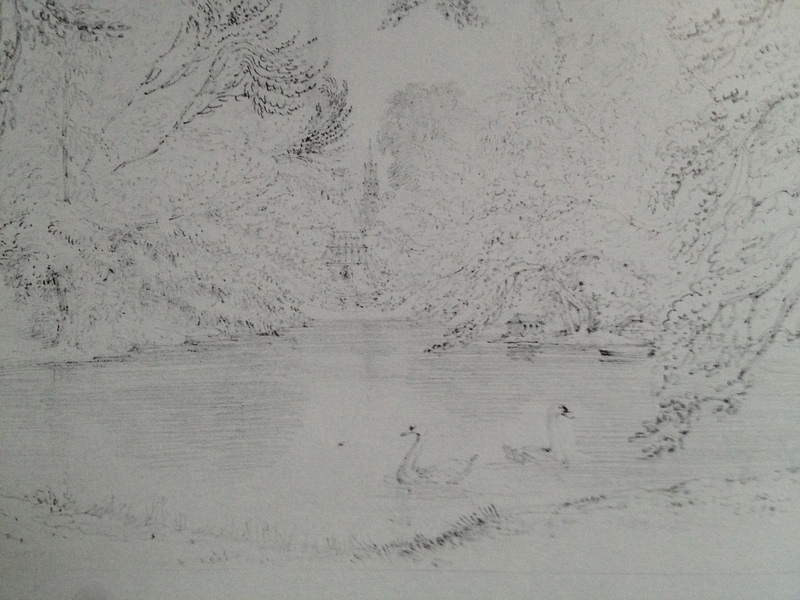 We have become so accustomed to the casino as the embodiment of neo-classicism it can come as a shock to discover that not far away on the same estate was a tall Gothic tower known as ‘Rosamund’s Bower.’ Dating from 1762, it stood at the end of a serpentine lake populated by ducks and swans. The tower’s front imitated a ‘highly ornamental screen, adorned with tracery and niches…a crocketed pinnacle conveying the idea of a spire’ while the interior, lit by stained glass windows ‘has been fitted up to imitate a nave, and side aisles of a cathedral.’ Two views of Rosamund’s Bower are shown above. 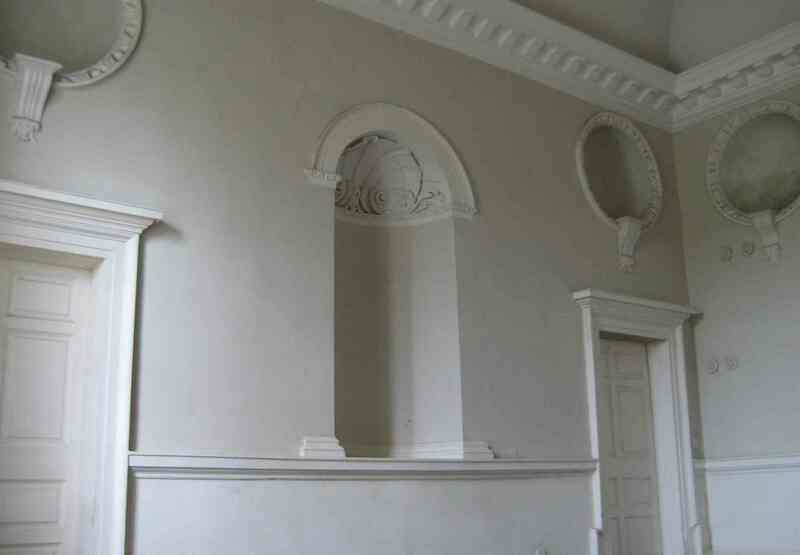 It has been suggested that this structure was designed by Johann Heinrich Muntz, a Swiss-born painter and architect who was encouraged by Horace Walpole to move to England where he worked with Sir William Chambers. 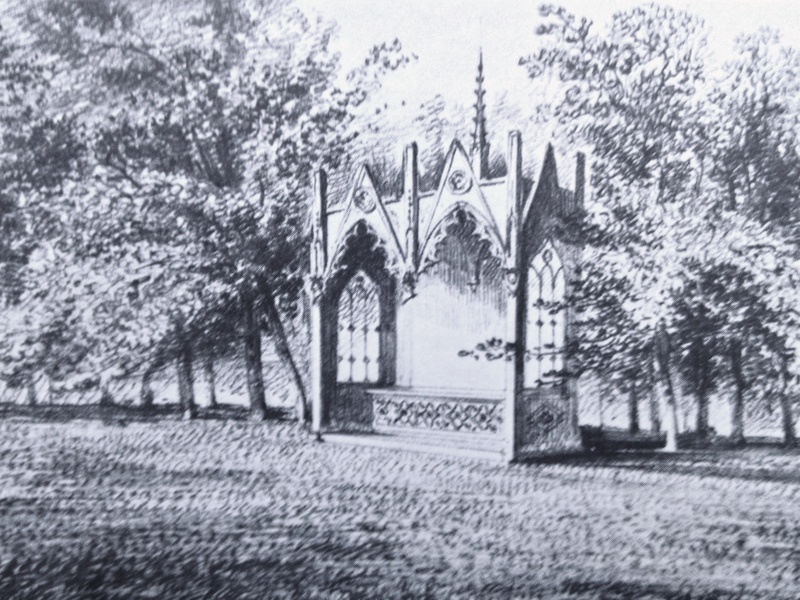 Marino House itself contained an ‘Egyptian Room’, so called because of its decoration, while elsewhere in the grounds could be found rustic hermitages, a root house and a moss house, together with such resting points as a covered gothic seat which, in a surviving drawing looks like a much-pinnacled bus shelter. 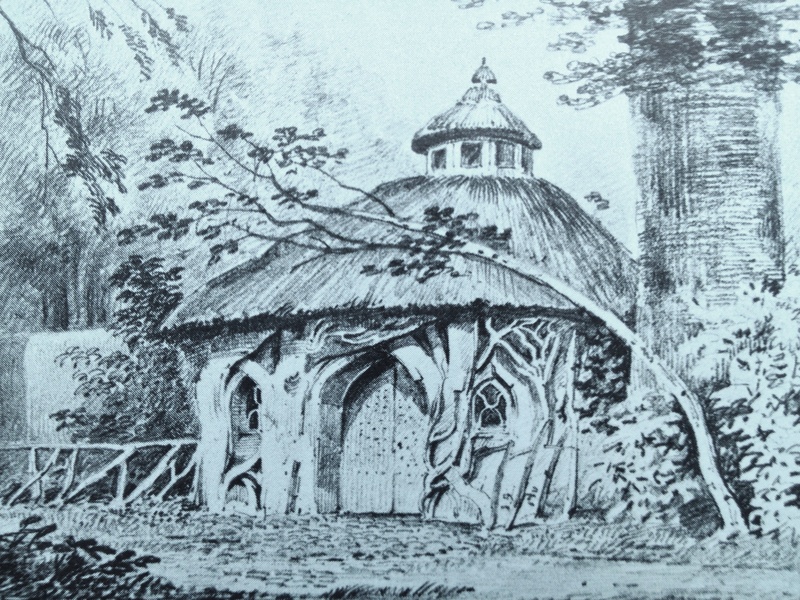 A handful of drawings of the other structures at Marino were made by Thomas Roberts’ younger brother, confusingly called Thomas Sautelle Roberts. Two of them can be seen below and offer us a suggestion of how the grounds of Marino must have looked in the late 18th century. The greater part of Marino as originally laid out no longer exists, and with it has gone the context in which the casino was intended to be seen and understood. 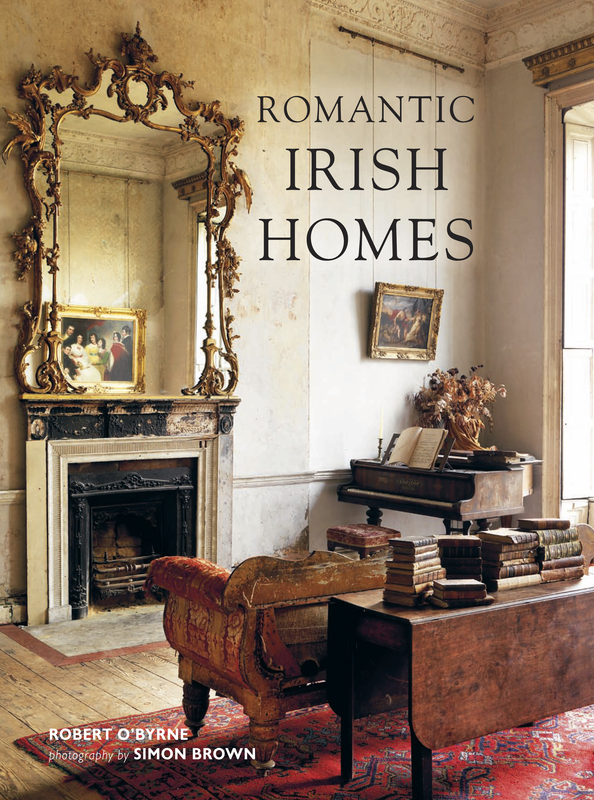 Like so many Irishmen before and since Lord Charlemont spent beyond his means and left his heir heavily in debt. 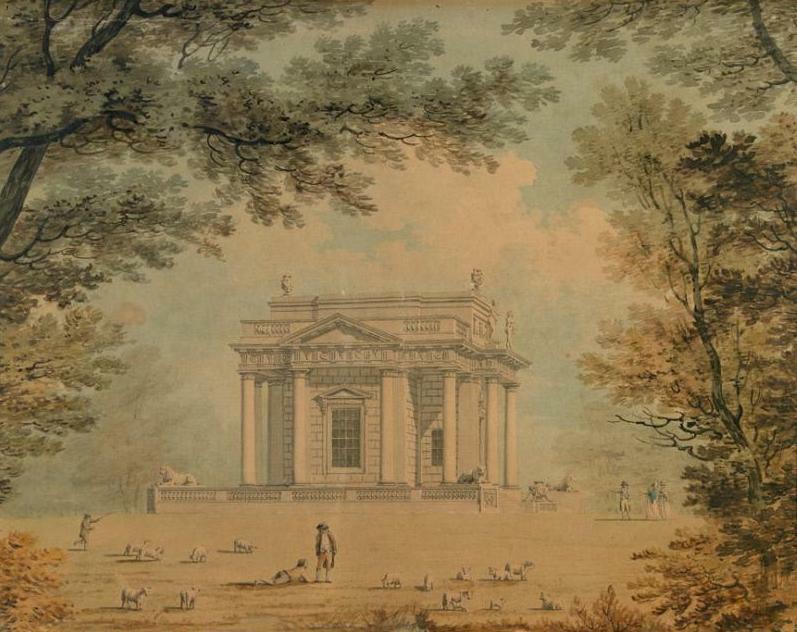 The family never recovered and even by 1835 the Dublin Penny Journal could remark that the estate’s grounds, to which Charlemont had always admitted the public – and in which he was mugged on a number of occasions – had ‘now lost its attraction – it has long been neglected’ while Rosamund’s Bower was ‘in ruins and a stranger seldom visits it.’ Furthermore the estate’s proximity to an expanding city made it vulnerable to encroachment. 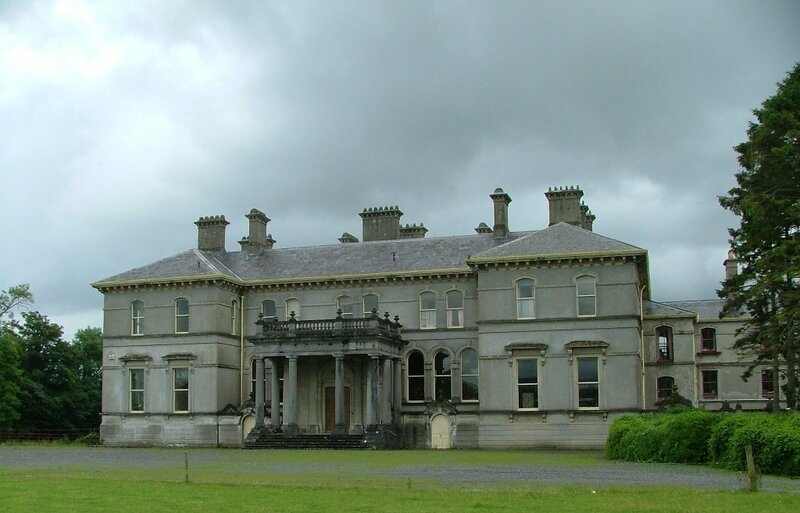 In the early 1880s the Caulfeilds sold the land to the Christian Brothers who initially occupied Marino House but eventually moved to other buildings put up in the grounds. 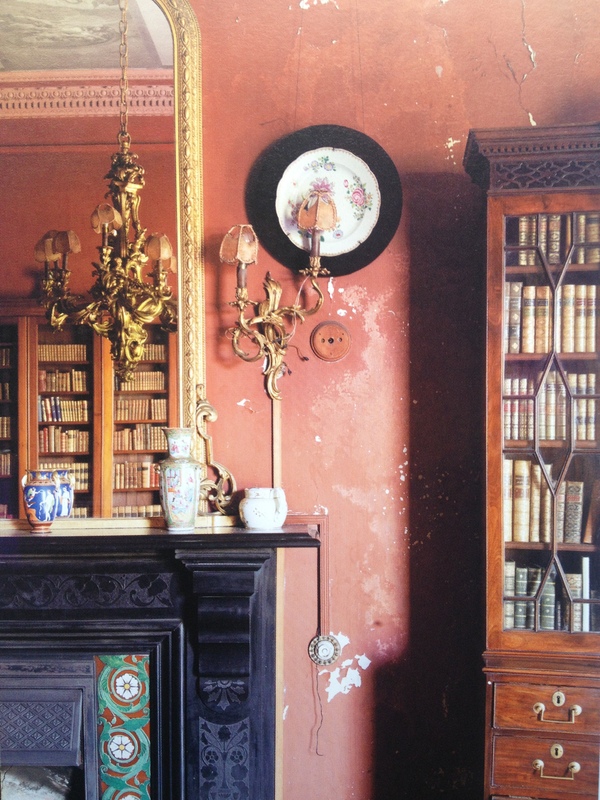 In the 1920s Dublin Corporation acquired some 90 acres of the former estate and build almost 1,300 houses for local families; it was at this time that Marino House was demolished with almost nothing other than a couple of chimneypieces salvaged. The casino might likewise have been lost but thankfully its importance was recognised: in 1930 the building was taken into state care, the first post-1700 structure to be designated a National Monument. Now standing on just a few acres and surrounded on all sides by buildings of later date and lesser merit, today the casino is looked after by the Office of Public Works and open to the public. 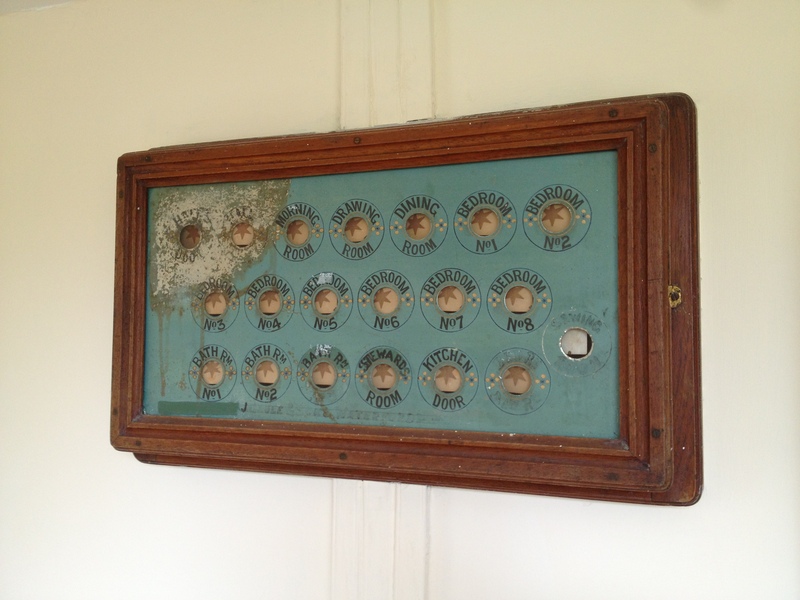 No longer in use but still in place: the old servants’ bell box at Fort William, County Waterford. 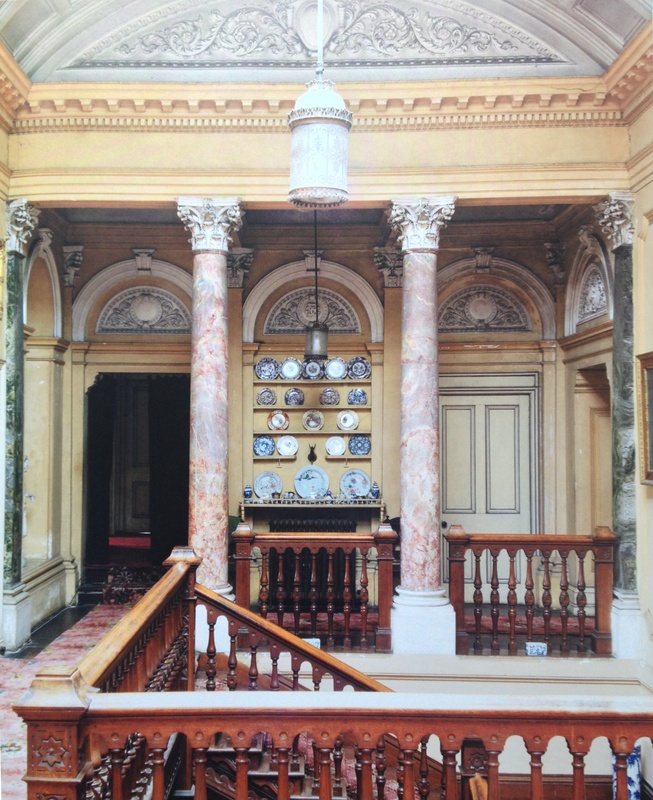 Note that when this was put up the house enjoyed the luxury of no less than three bathrooms between eight bedrooms. Trust me, that’s more than some large Irish houses possess even today. I shall be writing more about Fort William in a few weeks’ time. 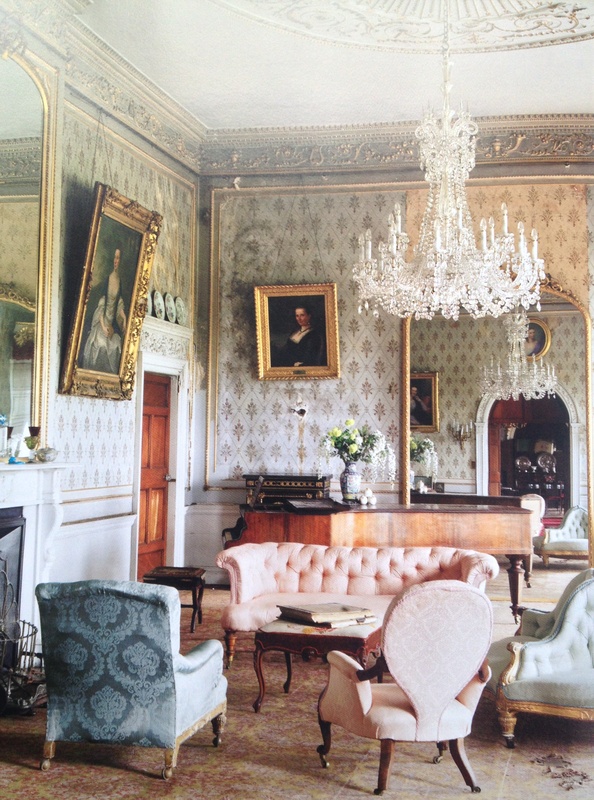 Here is Russborough, County Wicklow, a house long close to my heart. Engraved from a drawing by John Preston Neale, this image appeared in the second series of Views of the Seats of Noblemen and Gentlemen in the United Kingdom published in 1826. Russborough opens to the public for the season tomorrow so do think of paying a visit in the coming months, whether by horse or other means of transport. The photograph above was taken in autumn 1913 by John Cooke, then Hon. Treasurer of the National Society for the Prevention of Cruelty to Children, for presentation to the Dublin Housing Inquiry in November of that year. 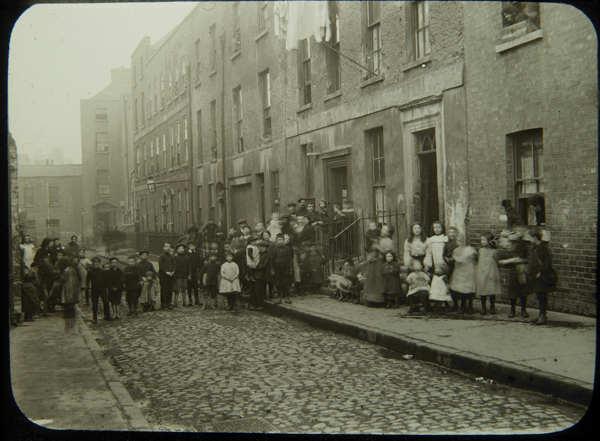 Showing Chancery Lane, off Bride Street, it is one of a number of Cooke’s images on exhibition until April 2nd in the Little Museum of Dublin, 15 St Stephen’s Green. 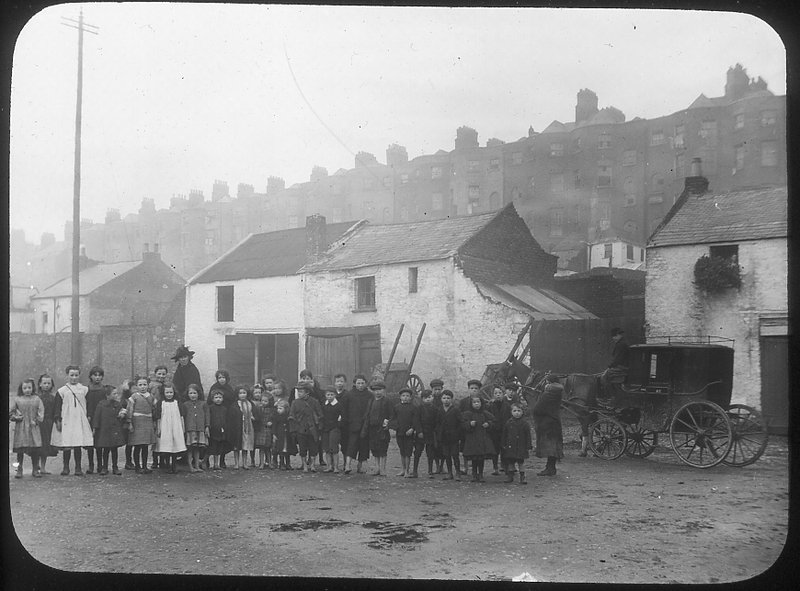 I imagine that for most people the photographs are of interest because they serve as a record of the dreadful conditions in which far too many Dubliners then lived: at the time the city enjoyed a dubious reputation for having the worst tenement slums in Europe. To me, however, the pictures also provide a poignant record of Dublin’s architectural losses: not a building featured in the photograph of Chancery Lane remains. Look at the handsome projecting lamp towards the end of the street, and the wonderful cut-stone doorway just beyond. Gone, all gone. During the second half of the last century accommodation in large parts of the city centre was rightly improved, but was it absolutely necessary that this should have been at the expense of so much old housing stock? 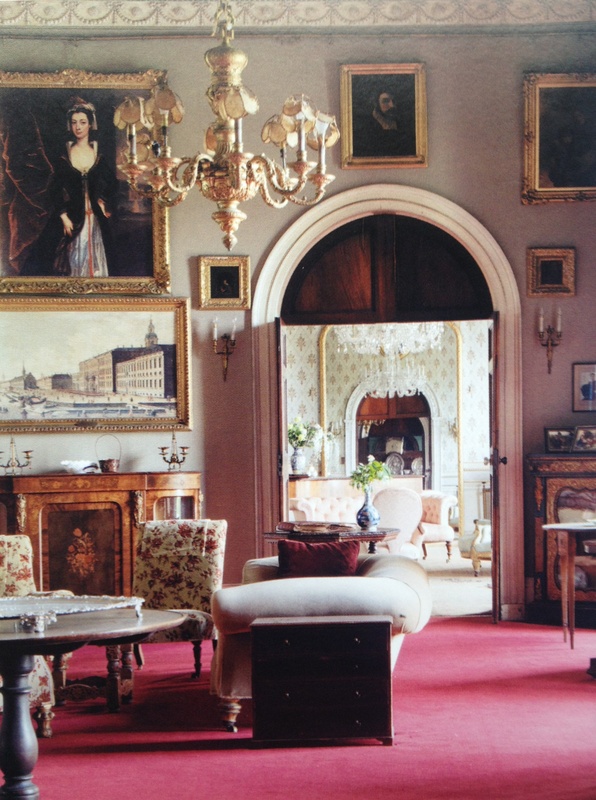 No structure, however dilapidated, is ever beyond repair provided sufficient will to restore it exists. I have always thought it was more because of what they symbolised rather than owing to their poor condition that so many buildings were torn down – and even today some continue to be at risk for the same reason. We must learn to understand our architecture, not for what we believe it represents – whether that be British colonial rule or an expression of our yearning to be ‘modern’ – but for its inherent merits. These lost buildings, even in the shocking state seen here, could have been salvaged and preserved for future generations to appreciate. So too might have been the terrace seen towards the back of the photograph below. Another image by Cooke, it shows the rear of Summerhill, part of the Gardiner estate begun c.1733 but largely developed in the 1780s. I remember those immense brick houses, each with a splendid bow from which the original occupants were offered unimpeded views of Dublin Bay. Now none remain: after lasting for 200 years they were swept away in their entirety around 1980. No matter how much better housed, we are the poorer for their loss. 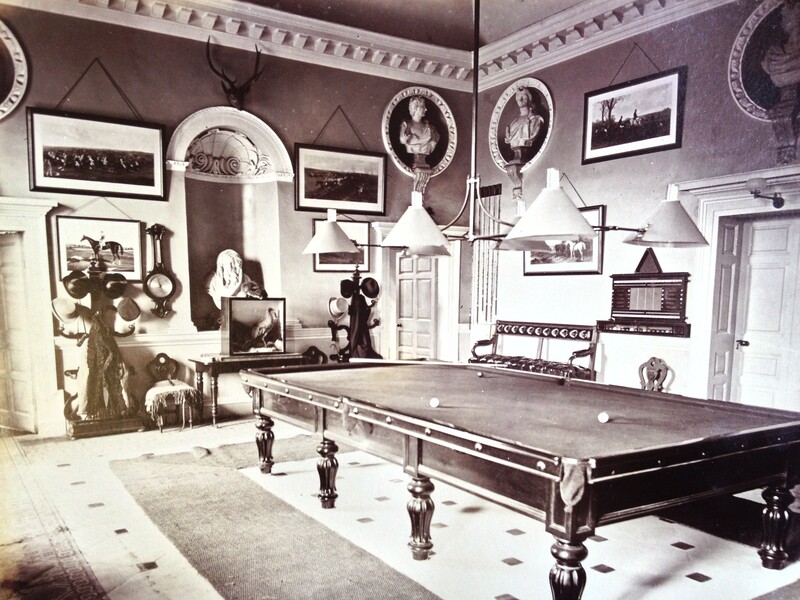 Photographs reproduced by permission of the Royal Society of Antiquaries of Ireland.